AZRAQ REFUGEE CAMP, Jordan -- Republican presidential candidate Ben Carson said Saturday, after visiting a camp for Syrian refugees, that the displaced should be absorbed by Middle Eastern countries, with the international community sending aid and "encouragement" to the host nations. 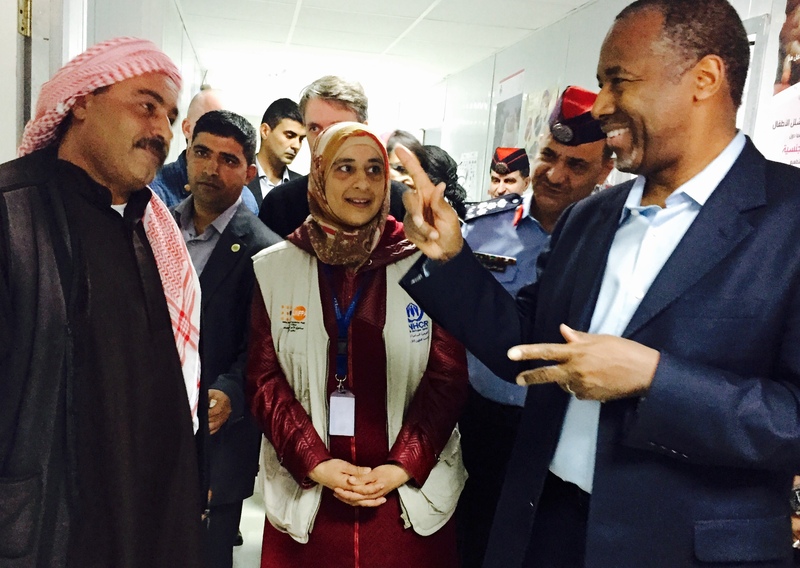 Carson toured the Azraq camp in northern Jordan under heavy Jordanian security, with journalists barred. Carson's campaign also limited access, not providing his itinerary and releasing only a short statement after the camp visit. In a statement, Carson said that he met with medical professionals, humanitarian workers and government officials. The candidate has repeatedly struggled to discuss international affairs as they become a greater focus in the 2016 presidential contest. Advisers have conceded that his foreign policy fluency isn't where it needs to be and have expressed hope missions like his two-day trip to Jordan will help change that. Carson and other Republicans have adopted a harsh tone when discussing President Obama's plan to welcome 10,000 Syrian refugees to the U.S. in this budget year. Debate over Syrians fleeing their war-torn country erupted after a series of attacks in Paris earlier this month that raised security concerns across the West. Carson and his GOP rivals expressed concern that extremists may sneak into the U.S. among them. Last week, Carson likened blocking potential terrorists posing as Syrian refugees to handling "mad dogs." After the Azraq visit, Carson suggested that it would be best to absorb Syrian refugees in Middle Eastern host countries, which have given temporary shelter to most of the more than 4 million Syrians who have fled civil war in their country since 2011. "Syrians have a reputation as very hard working, determined people, which should only enhance the overall economic health of the neighboring Arab countries that accept and integrate them into the general population," he was quoted as saying. "The humanitarian crisis presented by the fleeing Syrian refugees can be addressed if the nations of the world with resources would provide financial and material support to the aforementioned countries as well as encouragement," the statement said. "There is much beauty in Syria and I suspect that many displaced Syrians will return there when peace is restored," he added. Carson also promised that in the coming days, he would offer up "real solutions to the problems created in part by the Obama Clinton Administrations [sic] failed policies." Carson added that "the United States must do more" but says that "bringing 25,000 refugees to the United States does nothing to solve this crisis." "Jordan already houses 1.4 million refugees. Jordan needs and deserves our help," the retired neurosurgeon said. He praised the country for doing an "amazing job opening its doors and extending a hand in relief." An aid appeal of $4.5 billion for refugees in host countries in 2015 is only about half funded. The cash crunch has created increasingly unbearable conditions for Syrian refugees in Jordan, Lebanon, Iraq and - to a lesser extent - in economically more robust Turkey. In 2015, hundreds of thousands of refugees moved on to Europe in hopes of a better life. CBS News' Erica Brown contributed to this report.